On September 28th 2004, Dr. Gustavo Lopez Ospina, Regional Director of UNESCO for Latin America and the Caribbean, signed an inter-institutional agreement with SELVA-Vida sin Fronteras. This document officialised what previously had merely been a dream. 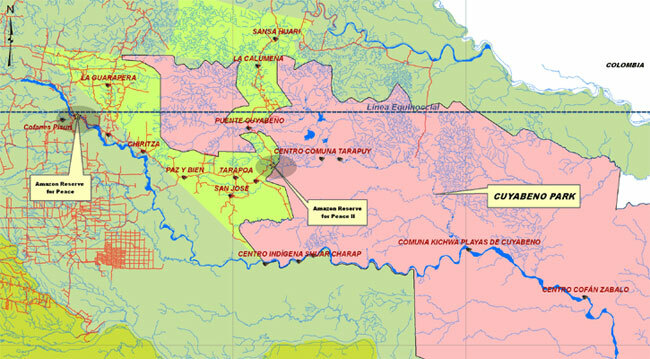 The need to constitute and consolidate the “Amazon Reserve for Peace”, in the heart of the headwaters of the Amazon River basin. Peace is an inalienable right for all forms of life. A permanent presence and social interaction in the field is paramount to understanding the rationality of empirical reality, especially if our objective is to actively address critical human and environmental issues. We are grateful to the UNESCO Regional Director for ‘ the Amazon Reserve for Peace Declaration’ and for believing that our work, based on the philosophy of Harmonizing Nature with Human activity, coincides with the principles stipulated in the United Nations Decade of Education for Sustainable Development 2005-2014; as per resolution 57/254. Dr. Gustavo López Ospina, UNESCO Director for Latin America and the Caribbean, signing the Declaration “Amazon Reserve for Peace”.